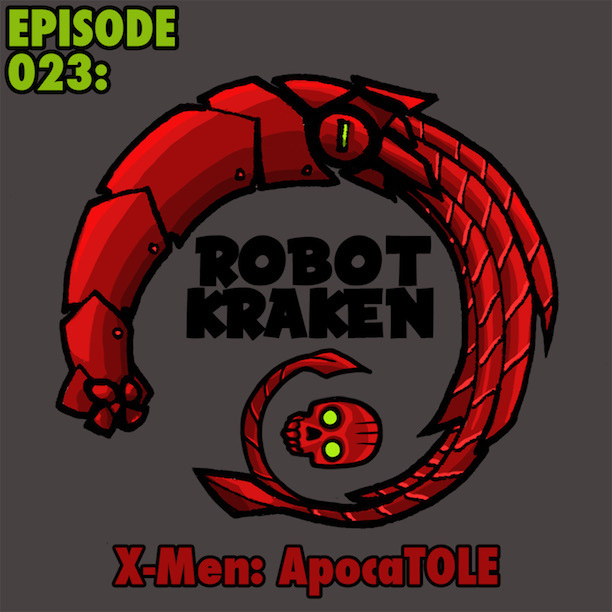 This episode marks the first of our new long-play format for the Robot-Kraken Podcast. We have moved to a monthly release schedule, with multiple hours of content per episode! SWEET RUMBLINGS OF THE DEEP – ROBOT KRAKEN IS BACK! 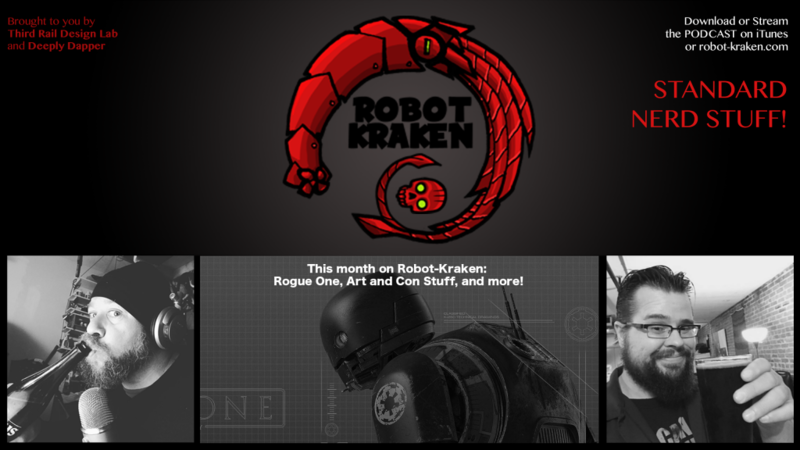 In our first of our new format – Robot Kraken goes monthly and long format! Now you can depend on a nice, long, rambling episode each month with less news filler you get everywhere else and more reviews, discussions, art techniques and interviews! Strap in and join us in our journey down to the mighty Robot Kraken where we regale him with talk of our lives over the last few months, a two and a half hour discussion of Rogue One and more! And now, you can even listen to it on youtube, and see our pretty faces for four hours while you do it! Ep 026 – Pizza For All The Dinners – Rose City Comic Con 2016 Con Report! Episode 25! In a groundbreaking feat of eclectic electronical engineering and magic, Thom and Kris appear in the same place at the same time in a hotel in Portland Oregon to discuss their experience at the ROSE CITY COMIC CON! Robot-Kraken Podcast Episode 25! Kris and Thom chat about the much maligned 2015 “film” Josh Tank’s FANTASTIC FOUR. Come get some! For Timestamps and applicable links from this episode will be updated soon, if not later, or possibly never! The Tick is one of those properties that comes with heavy baggage. It’s a fringe show that’s primarily aimed at the superfans, with hopes of breaching mainstream enough to gain eyeballs, yet those same superfans are rabid about what does and doesn’t constitute true Tick material: the comic? The animated series? The Patrick Warburton series? When I sat down to watch this new pilot, I came in wary: not because I had expectations, really, but because we’ve seen a few projects over the last few years of this seemingly golden era of comic adaptations that fell apart: Powers, which i’m still slogging through despite it’s peculiar missteps, being the best example for me. Many superfans have cried foul over everything from Preacher on AMC to the Watchmen movie. It’s too different from the material! It’s too similar to the material! But I’m one of those guys that couldn’t care less, as long as its good. I mean, I watch a lot of mediocre genre television, due to circumstance. My lovely wife is addicted to Once Upon a Time, which is a hot mess. I follow Gotham, which is a garbage fire. Somehow these projects seem so mainstream and carefree about their source material that I don’t feel offended by it. But when you get a true comic adaptation that claims to be an inspired project, it can get frustrating, looking at the missed opportunities. I’ll talk about Powers later, probably in the Robot Kraken podcast first, but watching something like this, and even considering limited budgets, you can see where it isn’t the plot or the actors or even the budget that bothers you: it’s a lack of vision and style in the storytelling, and a sense that the train is hurtling along with the engineer dead at the controls. Which is all to say that what gives me hope about the new Tick series is that it seems purposeful. It’s flawed and awkward thus far, at pilot stage, but using the pilot as a gauge for the tone of the show, I’m going to give it a go. This version is darker than the madcappery of the Warburton era (he remains a producer)… which I think perfectly captured the tone of the source material. i have a warm spot for that show, despite not having seen all of the episodes. I loved the characters I DID see, and the performances. It felt very Tick. Spoons and hammery everywhere. This Tick, however, feels like a cross between Donnie Darko, Super, and some indie film featuring Paul Dano (think Little Miss Sunshine)… and that’s a very good thing. This Arthur, played by Griffin Newman, is not justa nebbish accountant or whatever, but a dude holed up in an apartment, with serious mental health issues. He was (SPOILERS FROM HERE) as it happens, the famous child whose father was killed when the evil Terror, played brilliantly as usual by Jackie Earl Haley, murdered the entire Fantastic Four analog, the Flag Five. He was the kid on the cover of the magazines with the tragic look on his face that captured a million hearts and never outlived the experience. Despite the world being told that the Terror was killed by the Superman analog, Superian, played by Brendan Hines, Arthur continues to believe the villain lives and has been building a power base in the underworld. We have maps and the classic obsessive detective or serial killer wall of interconnected clues, we have the protagonist venturing out in the middle of the night alone to prove his theory that no one will take seriously, and we have the sudden appearance of a new, magnanimous and manic superhero, The Tick (played earnestly by Peter Serafinowicz, who stole Guardians of the Galaxy, at least in the trailers)/… despite having no previous established record of existence, having impossible powers, and conveniently appearing and disappearing randomly… all as experienced by a character who may be schizophrenic. What better way to explain a character like the Tick, in all of his random lunacy, then establishing as a premise that he may not exist? We’ve seen this many times before, but it’s a great mechanism. I like the casting so far, and while the pilot is completely stolen by Haley, I like the darker tone and strange cadence of Serafinowicz’ take on the titular hero. One hurtle for me, I have to admit, is that my brain wants this to be Will Arnett. Maybe it’s his vocal work on Lego Batman, or his generally excellent straight delivery of lunatic characters, but every time Serafinowicz appears, I’m disrupted. I want Arnett. I confess he is doing an excellent job, and I’m intrigued by his delivery, which is actually more complex and weird than either Warburton or Arnett. I just need more adjustment time. What I like about it is that it takes it’s supers stuff seriously. As much as the fate of the Flag Five in the pilot, or the interview of Superian on a talk show, feels like vintage Garth Ennis, it doesn’t have that cheesy 1990’s-era cosplay feel for the supers characters. They feel fairly ‘realistic’. Superian’s costume is once again strangely low on the dynamism for a Superman analog, but the Terror, the Tick, and Arthur in costume at the end of the pilot, are wearing uniforms that are movie quality. The presentation feels fairly legit. I’m not sure about the weird, scaly appearance of the Tick’s suit, particularly from the rear, but I can dig it just as much as the smooth cartoony vibe of Warburton’s version. Anyway, it’s a free viewing if you have Amazon Prime, and I encourage you to check it out! Episode 24! Kris and Thom cover all of the news from San Diego Comic Con – and lose 45 mins or so due to technical glitches. Episode 23! Kris and Thom discuss/argue about X-MEN APOCALYPSE, discuss art in the Shipyard, and in Robot’s Root cover Ghostbusters, Pokemon, Comic Sales and more geeky news! Ep 22 – The July Root – Nerdy News Update! Episode 22! An all news and discussion episode! Thom and Kris talk about art techniques and what’s on the slab in The Shipyard, cover nerdy news and talk about what they’re looking forward to with the future months to come in geeky entertainment! 16 min – The Root! The New Episode of ROBOT KRAKEN is out! Episode 21! That means we are old enough to drink that sweet Unofficial Official Sponsor of Robot-Kraken – Kraken Rum! In addition to the Rum, we talk about the season finale of GAME OF THRONES, movie news, planned plundering and more Standard Nerd greatness you have come to expect from us! Episode 20! We discuss the newest two episodes of season six of GAME OF THRONES – Episodes 8 and 9 in a spoilery fashion! We also discuss beer,Anton Yelchin, new movie trailers, the Justice League rumors, video games and more on this giant sized episode! Robot-Kraken Podcast Ep 19 – GAME OF THRONES Season 6 Episodes 6 and 7 – T1ts and Krakens! Episode 19! We discuss the newest two episodes of season six of GAME OF THRONES – Episodes 6 and 7 in a spoilery fashion! We also discuss drinking, legos, nerdy news, gardening and more on this hound-sized episode of ROBOT KRAKEN! Now with timestamps, for science!